Earth, the third planet from the Sun, is our home planet. Its surface is mostly water (about 70 percent) and it has a moderately dense nitrogen-and-oxygen atmosphere that supports life—the only known life in the universe. From space, Earth appears as a shining blue ball with white swirling clouds covering vast oceans and irregular-shaped landmasses that are varying shades of green, yellow, brown, and white. Earth orbits the Sun at a distance of about 93,000,000 miles (150,000,000 kilometers), taking 365.25 days to complete one elliptical (oval-shaped) revolution. The planet rotates once about its axis almost every 24 hours. It is not truly spherical, but bulges slightly at its equator. 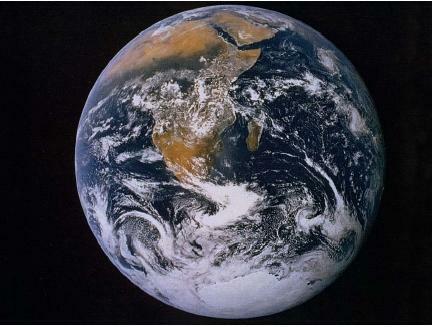 Earth's diameter at the equator is roughly 7,926 miles (12,760 kilometers), while its diameter at the poles is 7,900 miles (12,720 kilometers). The circumference of Earth at its equator is about 24,830 miles (40,000 kilometers). Earth's only natural satellite, the Moon, orbits the planet at an average distance of about 240,000 miles (385,000 kilometers). Some scientists believe that Earth and the Moon should properly be considered a double planet, since the Moon is larger relative to our planet than the moons of most other planets. Unlike the outer planets, which are composed mainly of light gases, Earth is made of heavy elements such as iron and nickel, and is therefore much denser. Hot at first due to the collisions that formed it about 4.5 million years ago, Earth began to cool. Its components began to separate themselves according to their density. Heavy abundant elements, iron and nickel, formed Earth's core. Outside the core numerous elements were compressed into a dense but pliable (bendable) substance called the mantle. Finally, a thin shell of cool, silicon-rich rock formed at Earth's surface, called the crust or lithosphere. Formation of the crust from the initial molten blob took half a billion years. Earth's atmosphere is the only planetary atmosphere in the solar system capable of sustaining life. It is made of 78 percent nitrogen, 21 percent oxygen, and a 1 percent mixture of gases dominated by argon. Various theories have been proposed as to the origin of these gases. One theory states that when Earth was formed, the gases were trapped in layers of rock beneath the surface. They eventually escaped, primarily through volcanic eruptions, to form the atmosphere. Water vapor was the most plentiful substance spewed out, and condensed (change from a gas to a liquid) to form the oceans. Carbon dioxide was second in terms of quantity, but most of it dissolved in the ocean waters or was altered chemically through reactions with other substances in the rocks. Nitrogen came out in smaller amounts, but always remained in its present form because it never underwent reactions or condensation. It is believed that for that reason, nitrogen is the most abundant gas in the atmosphere today. Oxygen only became a part of Earth's atmosphere when green plants came into being. Through the process called photosynthesis, green plants convert carbon dioxide into oxygen. Oxygen is also removed from the atmosphere when green plants, as well as animals, die. As they decay, they oxidize, a process that uses up oxygen. Another more recent theory regarding the development of Earth's atmosphere states that the elements found in it were deposited there by comets. Debris from comets has been shown to have carbon and nitrogen in roughly the same proportion as the atmosphere. During its early development, Earth was the site of repeated comet collisions. heat (infrared radiation) is reradiated from the surface, but is prevented from totally escaping back into space by carbon dioxide, methane, and water vapor in the atmosphere. These so-called greenhouse gases absorb most of this energy and re-emit back to the surface, keeping the planet at relatively stable, warm temperatures. The average surface temperature is 59°F (15°C). While keeping in necessary heat radiation, components in the atmosphere block dangerous forms of radiation from reaching the surface. These include X rays and ultraviolet radiation, which is absorbed by the ozone layer located at about 15 miles (24 kilometers) above Earth's surface. The surface of Earth is divided into dry landmasses and oceans. Landmasses occupy roughly 57.5 million square miles (148.9 million square kilometers) of the planet's surface, while oceans cover roughly 139.5 million square miles (361.3 square kilometers). Landmasses are in a constant, though slow, state of change. 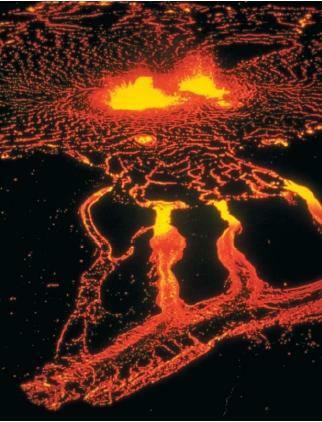 They move, collide, and break apart according to a process called plate tectonics. The lithosphere is not one huge shell of rock; it is composed of several large pieces called plates. These pieces are constantly in motion, because Earth's interior is dynamic, with its core still molten (liquid) and with large-scale convective (circulating) currents in the upper mantle. This resulting giant furnace beneath the surface moves land no more than a few centimeters a year, but this is enough to have profound consequences. The unending cycle of mountain building (caused by movement of the crustal plates) and erosion (by wind and water) has formed every part of Earth's surface today. Earth is mostly covered with water. The mighty Pacific Ocean covers nearly half of the globe. The existence of oceans implies that there are large areas of the lithosphere that are lower than others, which form huge basins. Early in the planet's history these basins filled with water condensing (raining) out of the primordial (primitive) atmosphere. Additional water was brought to Earth by impacting comets, whose nuclei were made of water and ice. The atmosphere has large circulation patterns, and so do the oceans. Massive streams of warm and cold water flow through them. Circulation patterns in the oceans and in the atmosphere are driven by temperature differences between adjacent areas and by the rotation of Earth, which helps create circular flows. Oceans play a critical role in the overall weather patterns of our planet. Storms are ultimately generated by moisture in the atmosphere, and evaporation from the oceans is the prime source of such moisture. Oceans respond less dramatically to changes in solar energy than land does, so the temperature over a given patch of ocean is far more stable than one on land. The presence of life on Earth is, as far as we know, unique. The origin of life on Earth is not fully understood, but scientists believe amino acids, the essential building blocks of life, formed in the primordial oceans billions of years ago. Over eons, these building blocks combined and evolved into higher and higher life-forms. Life has existed on dry land only for the most recent 10 percent of Earth's history, since about 385 million years ago. Once life got a foothold beyond the oceans, however, it spread rapidly. Within 200 million years, forests spread across the continents and the first amphibians evolved into dinosaurs. Mammals became dominant after the demise of the dinosaurs 65 million years ago. Only in the last 2 million years, that is, 0.05 percent of Earth's history, have humans appeared. What percentage of Earth's total history has life (including primative life like the first single celled organism) existed? I find it interesting that to explain EARTH took 14 paragraphs with many key words for further reading. But to explain LIFE took only two paragraphs and no key words and the last sentence: "Only in the last 2 million years, that is 0.05 percent of Earth's history, have humans appeared." Evolution vs. Creation - that is the question. As for me I'll take Genesis 1:31 as my authority.